It's not on our short-term roadmap. You can however cut out a part of the desktop wallpaper and put it into the SensorPanel background, which would effectively "emulate" a transparent effect. It's not a perfect solution, but many AIDA64 users went that way. I've seen that clever workaround yet I am one of the users who has a slideshow background. Just a thought. Please put it on your roadmap if you can. Great piece of software overall. 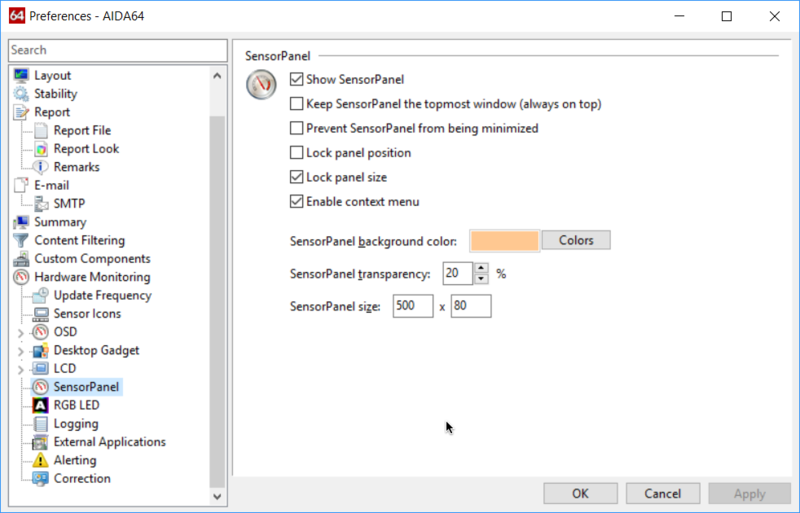 I didn't know about the sensor panel when I bought a64, but i find it the feature I use most now. Since there's a workaround for this issue (that I've mentioned above), we're not considering getting back to working on it. It would require us to come up with a new rendering solution, so it's not a few days work. And performance of rendering may also suffer because of transparency. @Aidaknow, @TungstenMD - I've created a tool (still beta version), that automates workaround mentioned above. It triggers whenever Windows background changes, takes a snippet of current background, and saves it to a file (you'll setup Aida64 to use this file as panel background and It'll automatically reload it's background whenever said file changes). I plan on preparing some more detailed description, and improving this tool, but since it might be hard for me to find some time - I hope this will somewhat solve the problem. Note 1: Your input file will vary (it's most likely C:\Users\ [YOURUSERNAME] \AppData\Local\Microsoft\Windows\Themes\TranscodedWallpaper). Note 2: Right now all wallpapers in slideshow need to be correct size, as no rescaling is implemented. This trick doesn't work for me anymore, I have a full hd screen and the default DPI is 125% when I try to cut the wallpaper to use as background on the sensor panel it's not aligned. @tegazinho, it's happening because desktop wallpaper isn't changed by Windows scaling, while Sensor Panel is. Your workaround is total garbage in these days and ages. My background is Aquasuite from Aquacomputer, a dynamic background. I'm guessing I'm not alone having a dynamic background. And for someone up there's sake, is it so very difficult to add transparency? Total garbage? Or would you have me believe it's difficult to add transparency background? Yes, it is very difficult to develop a fully transparent SensorPanel.